People who are diagnosed with multiple sclerosis should get treatment as soon as possible, experts are saying, as they call for an end to the UK’s current “wait and see” approach. For decades, it has been assumed that drug treatment is best postponed until patients really need it, but the results of a 21-year study published in 2012 shocked experts into a rethink. It revealed that in the trials of the original MS drug, beta interferon, those who were put on medication at the beginning were half as likely to have died as those who were originally on placebo and then given the drug three years later, when the trial ended. “That was so powerful that it lead a lot of us to start reviewing the evidence,” said Nick Rijke, director of policy and research at the MS Society. They concluded that even when people have mild symptoms and their MS appears to remit as well as relapse, which is the early pattern of the disease, there can be underlying progressive damage to the nervous system, caused by attacks from the patient’s immune system, which drugs may be able to prevent or postpone. A consensus statement from professionals and patient groups published on Wednesday calls for neurologists to start drug treatment as soon as possible after diagnosis. Sometimes that can take time, because the treatment options are complex and it is up to the patient to choose what they prefer. Modern drugs can be aggressive and very effective, but there are risks of serious side-effects to take into account. But the experts say a treatment plan should be in place within six months. Patients should also have an MRI scan at least once a year. MS affects about 100,000 people in the UK, but only 40% are receiving treatment, according to a survey by the MS Society. The UK is ranked 25 of 27 European countries on the proportion prescribed these treatments, with only Poland and Romania doing worse. “In the UK, the most common treatment option for MS in its early stages is currently no treatment and this needs to change for the sake of tens of thousands of people’s health,” Michelle Mitchell, the MS Society’s chief executive, said. Suzanne Crighton, 52, was diagnosed in 1991 when there were no disease-modifying drugs, as they are known because they slow progression but do not cure. She was in the armed forces, working as an instructor in logistics at the RAF College Cranwell, when she realised something was wrong with her sight and her hearing. She could not drive and struggled to hear her students. She remembers thinking she was probably better off not taking the drugs because they do have side-effects, “but not realising it wasn’t just during the times of the relapses that damage was being done”. Now Crighton fears her health may have been damaged. The drugs she was taking stopped working after a few years and her primary care trust was reluctant to pay for a new drug, though it had been approved by the National Institute for Health and Care Excellence (Nice). During a year without treatment, she had five relapses. 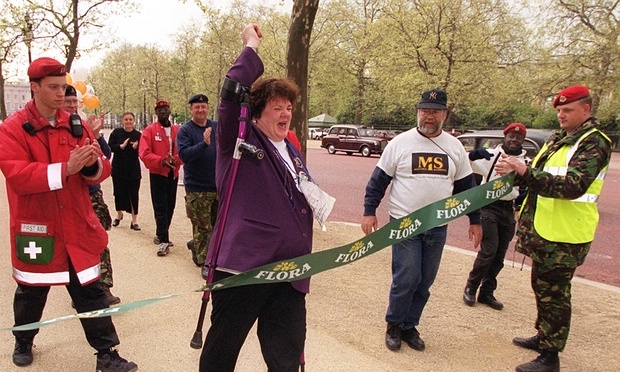 Now, however, she is out of a wheelchair and back in action, running a charity for people in the military and their families who have MS, called Mutual Support. “The latest drug I have been on now for more than three years has completely changed my life,” she said.